Ever wished you hadn't sent a WhatsApp message? 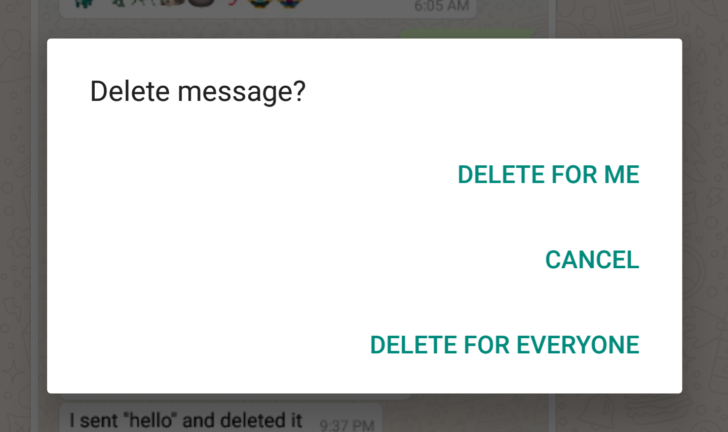 Whatsapp has just rolled out a new feature which is officially called - "Delete for everyone". The feature will only work if all recipients of a particular message are running the latest version of WhatsApp. So, here is complete detail about this feature and how is it work. This feature is now available for most of the user in India. This feature is available in the latest version of Whatsapp for Android, iPhone and Windows phone users. The feature that started rolling out on Friday morning is now seemingly reaching almost everyone. By using this feature, you can delete messages for everyone or just for yourself. This feature is available for both Android as well as iPhone users and also for Windows phone users. Deleting messages for everyone allows you to delete specific messages you have sent to either a group or an individual chat. This can be useful if you sent a message to the wrong person or chat or if the message you sent contains a mistake. It never worth if you won't be able to delete any message that you forwarded or in other words a message that is in quotes. It is also important to realize that even if you deleted a message that doesn't mean it wasn't read. You will not be notified if deleting for everyone was not successful. It is possible that before you deleted a message, it was read, and it is also possible that it was screenshotted.